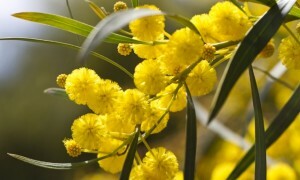 The lovely Wattle Flower or Golden Wattle, is the national flower of Australia. This flower has a cheery saffron hue and it’s known by the scientific name, Acacia pycnantha Benth. You’ll find the Wattle Flower on many Aussie stamps and it’s also displayed on the emblem of the Order of Australia. We`ll share some basic facts about this flower and also talk about why it means so much to residents of Australia. We`ll wrap things up by telling you the best and most practical way to grow this flower. Once you`ve learned the facts, you`ll know quite a bit about this pretty yellow flower. The flower grows on an evergreen spreading shrub which is part of the Fabaceae family. 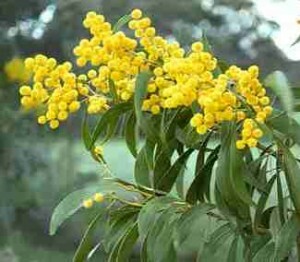 The flowering Wattle Flower shrub may grow as high as twenty-five feet and it features leaf stalks with flattened shapes. These stalks are known as phyllodes. Each phyllode has a sickle shape and most are between 3.5 and 9 inches long, with widths ranging between 1 centimeter and 3.5 centimeters. Wattle Flowers have a pleasing scent and their golden color makes them beautiful to behold. You’ll find them in blooming in nature during the end of winter and the end of spring. These flowers undergo cross pollination via two species of birds, which are Thornbills and Honeyeaters. The flowering tree which produces Wattle flowers is classified as an understorey type of plant and it is found in eucalyptus forests. Parts of New South Wales have these forests (the South of the country is one fine place to see Wattle Flowers) and they are also found in Australia’s Capital Territory, from Victoria into the southeast of South Australia. This flower was discovered by an explorer named Thomas Mitchell. He collected the first known specimen, which then received its species description from George Bentham. All of this happened during the year 1842. There are no recognized sub-species of this flower. 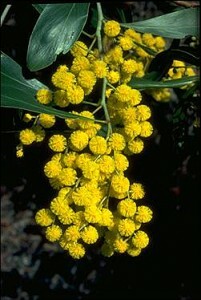 The Wattle Flower tree has commercial value as its bark contains a lot of tannin. Those who cultivate these trees often do so in order to harvest this tannin. However, it’s also a very decorative tree and many people grow these trees on their properties simply to enjoy their attractive appearance. The Wattle Flower is considered a weed in some nations where it grows – examples of nations where the blossom has “weed” status include Italy, India and Portugal. Even Western Australians consider this golden bloom to be a weed! This flower became the official floral emblem of the Land Down Under during 1988. Now, it is showcased on the nation’s postal stamps. Since the petals and stalks of this flower are gold and green, respectively, the plant echoes Australia’s national colors. In terms of symbolism, this flower is meant to denote unity. Wattle flowers are tough and resilient and Australians are known to have these traits, too. During times of crisis or mourning, Aussies may wear floral springs of Wattle flowers in order to show unity and national pride. Each year, there is a National Wattle Day on the first day of September. Wattle Day started long before the flower was officially recognized by the Australian government – it’s actually been happening since 1913. Plenty of Aussies also plant flowering Wattle shrubs at home, as a symbol of their national pride. Some Australian florists may offer Wattle Flowers to their clientele, particularly close to Wattle Day. While Wattle Flowers aren’t traditionally the most popular flower for cut bouquets, they do have special significance to Australians and this is why these “weeds” may find their way into local flowers shops in the nation. While it’s true that many people do grow their own Wattle flowers, and then cut these flowers themselves in order to make nosegays and other types of floral arrangements, florists may offer them to those who don’t “grow their own”. You may grow Wattle Flowers from seeds and this is pretty easy to do. These are hardy flowering shrubs and they should be sown during the spring or early fall. In order to plant them for best results, be sure to put seeds into seed trays or plastic containers (with holes) during the right times of the year. Potting mix should contain one part of clean river sand and one part peat moss. One the soil is prepared, scatter the seeds over the soil and then cover them with a thin layer of soil. After they begin to grow (you should see leaves), transfer these plants into a taller pot. Some people utilize milk containers in order to grow these plants from seeds. You shouldn’t have to fertilize – however, you may want to mulch in order to keep earth moist, retain the coolness of roots, keep weed growth minimal and boost soil health. Water the plants when they are quite young or when they look like they’re suffering during drier periods. Prune occasionally in order to keep shrubs in good condition. Now that you know more about Australia`s pretty and rugged national flower, you`ll have a better sense of why it means something to residents of the Land Down Under. Golden and strong, this simple flower, with its bright green stalks, provides pleasure and symbolism to millions of Aussies. Easy to grow and simple to use in floral arrangements, it`s a wonderful plant to enjoy during winter and spring and it`s definitely a great one to plant if you happen to live in the Land Down Under. Wattle flowers grow in many places, including home gardens. They may also be sold in florist`s shops, particularly in late summer, when Wattle Day is on the horizon. Hopefully, our comprehensive guide to this yellow flower has helped you to understand what it looks like, where it grows, why it`s special and what its history is in terms of its connection to Australia.